Because they are often difficult to identify, it is best to bring in a professional to determine if treatment, and to what extent, is needed to rid your home of wood destroying powder post beetles. Powderpost beetles breed in dead and dried hardwoods such as the dead branches and limbs of trees. Their presence is overlooked until they are discovered in stored lumber, rafters, joists, finished wood, and furniture products. As a rule, they enter lumber while it is being stored and cured, then later, emerge from the finished product. Old items of furniture and wood antiques are especially vulnerable to attack by the beetles. 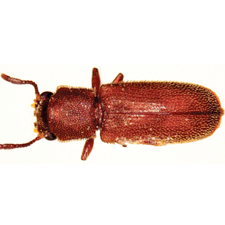 Powderpost beetles are small, brown insects (Fig. 1) usually less than 1/4-inch in length that attack seasoned hard-woods. A certain sign of their presence is numerous small holes about 1/16-to 1/8-inch in diameter and a fine, powder-like sawdust in flooring, paneling, furniture, and other wood materials. The dust results from the boring of the larvae. The holes are the openings through which the adult beetles emerge. Adult beetles deposit eggs in the pores and exit holes of seasoned lumber, usually in the spring. The mature larvae are small, white grubs about 1/5-inch in length. They produce the fine sawdust mentioned previously. The larvae overwinter in the wood and reach their adult stage in spring. 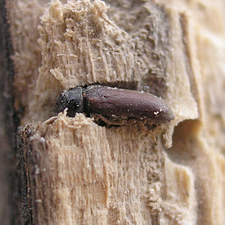 Adult beetles emerge from the wood through small round exit holes. Powderpost beetles prefer the sapwood of oak and other hardwoods and many of the insects will continue to breed in an infested piece of wood for generations. This practice can result in an ultimate destruction of the wood. Rough-cut lumber should be kiln-dried to kill all stages of the beetle. Uninfested wood which is sanded and varnished will not normally be attacked by the adult beetles because they cannot find crevices in the wood surface into which they would deposit their eggs. Items of value should not be stored in out buildings such as barns and sheds. 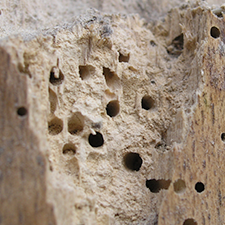 These buildings are often infested with wood-boring beetles. Infested furniture can be fumigated in a fumigation chamber. Only pest control operators licensed to do fumigations are permitted to purchase and use these materials. Fumigants are highly effective in eliminating all stages of powderpost beetles and leave no residues in or on the wood, but will not provide any protection from future attack. Surface sprays containing borates will prevent newly hatched larvae from entering the wood. However, this technique is not effective on wood which has been varnished, waxed or otherwise sealed from attack by moisture. If you purchase an item with numerous holes (such as an antique), demand that the dealer provide you with a receipt from the company that performed the fumigation.